A delegation led by Ali Abbasov, Minister of Communications and High Technologies of the Republic of Azerbaijan, participated in a solemn ceremony dedicated to the 150th anniversary of the International Telecommunication Union (ITU) of the United Nations (UN) specialized agency for information and communication technologies in Geneva, the Swiss Confederation on May 17-18. 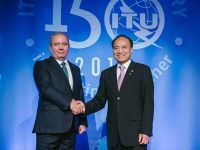 As Gold Partner of the Union, Minister Ali Abbasov made a speech at ITU events dedicated to the 150th anniversary of the Union as the head of communications administration of Azerbaijan. Minister congratulated the Union on behalf of the Government of the Republic of Azerbaijan and ICT community on the occasion of its anniversary. Noting the contribution of the ITU to the doctrine of Azerbaijani President Ilham Aliyev “converting black gold into human capital” and the development concept “Azerbaijan 2020: Vision into the Future” Ali Abbasov expressed gratitude to member states for their support in the elections held in Busan, South Korea, where our country was elected member to the Council of the ITU for the first time since its membership to the Union in 1992 . After the speech, Secretary-General Houlin Zhao awarded Azerbaijan acting as Gold Partner and Minister Ali Abbasov gold medal and certificate for great contribution to the events dedicated to the 150th anniversary of the ITU and his personal contribution to the development of information and communication technologies. After the official part of the anniversary ceremony, Minister Ali Abbasov held bilateral meetings with acting director general of the UN Office at Geneva, Michael Moller, executive secretary of the UN Economic Commission for Europe (UNECE) Christian Bach, heads of administration of Russia, Turkey, Saudi Arabia, United Arab Emirates, Uganda and Ruanda, as well as director of the Regional Commonwealth in the field of Communications (RCC), Chief Counsel to the President of ICANN, head of ITU Partnership and Resource Mobilization Division, head of the ITU Area Office for CIS countries and discussed areas of cooperation with Azerbaijan.